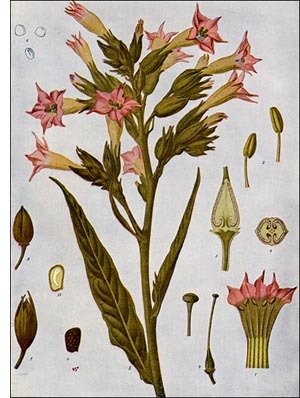 The Tobacco plant is a tall herbaceous annual with large simple leaves and terminal inflorescence, belonging to the nightshade family, the members of which resemble each other in that they are more or less poisonous and in that they have a disagreeable, nauseous, heavy odor. There are several species of tobacco, of which the above is the most highly valued, and they are all natives of warm countries, as southern Asia, India, South America, and the West Indies. Tobacco is very extensively cultivated in nearly all warm countries, especially in the southern United States and the West Indies. Tobacco requires rich soil and careful cultivation. The seed is sown in a hotbed or in a sheltered place in the open. The plants are set from April to June. The ground is carefully tilled, freed from weeds, and the plants watched f or cutworms and the big green tobacco worm, which are very destructive. Worms and eggs must be removed and destroyed. To increase the size of the leaves and hasten maturity, the flowering tops are broken off. When the leaves are matured, which is indicated by a yellowish mottling, the plants are cut off close to the ground, fastened in groups of six to eight, and dried. All unprejudiced authorities are agreed that the habitual use of tobacco acts injuriously upon the system, no matter in what form or manner it is used. Medicinally, tobacco is but rarely used now.